Create an unforgettable look with Stuhrling's women's Winchester watch. 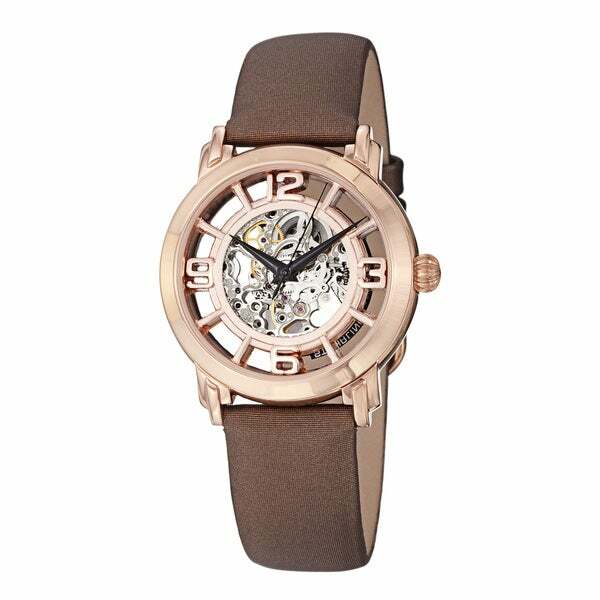 Featuring a gorgeous rosetone stainless steel watch face and a rich leather band, the modern-style skeleton dial offers a sleek complement to urban-chic wardrobes. The rosetone bezel, lugs and hands further accentuate the sophisticated timepiece with the metal's warm, natural glow. A sturdy satin-twill-covered leather and tang clasp securely fastens the timepiece, and the 26-hour power reserve makes it great for active lifestyles. Water resistance up to 165 feet means you don't have to shield the watch from exposure to moisture to keep it running great. Loved the skeleton look of this watch. Don't have to worry about a battery which is great as well. Got it for my wife's birthday and she loves it. My wife loved it and especially the satin leather strap. LOVE LOVE LOVE! Beautiful and automatic, no battery needed! I get compliments daily. Great watch. Exceeded my expectations! Gorgeous watch! Substantial and classy. Love it! for my 18 daughter who loves the open gear design. Liked the casual yet classy look.